Jane Irwin Harrison (July 23, 1804 – May 11, 1846) was the First Lady of the United States for a very brief period. She was married to William Henry Harrison Jr. William was the son of William Henry Harrison, ninth President of the United States. As the daughter-in-law of the president, she acted as the First Lady for about a month in 1841. She acted as his official hostess during his brief tenure in office, which lasted for a month in 1841. 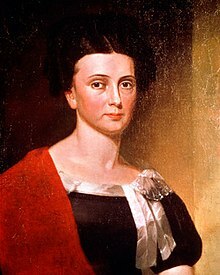 President’s wife Anna Harrison was very ill, and she could not go out of their home in Ohio, when her husband moved to take up the presidency. This page was last changed on 4 March 2019, at 18:45.